The constant queue at A&P stretches the breadth of the entire room, which looks more like a cafeteria than a café. The line snakes around tables as customers crane their necks to ogle the glass cabinets full of pastries, biscotti and other baked goods. If service seems a little on the slow side, it's because the folk behind the counter are packing orders into boxes with attention and care. This could be a blessing in disguise because (if you're like us) you'll want to take your sweet time choosing your loot. Takeaway is the way to go, but it's pleasant enough for coffee and a natter – the casual air of the place is reminiscent of Italian train station cafés. San Pellegrino varieties sit out the front, while the small shopfront window features assorted colourful cups and saucers and intricate-looking wedding cakes. It's not all sugar and caffeine, though – by late afternoon savoury snacks (pizza squares, panini) are fast disappearing, and we watch agape as a giant box of golden arancini walks out the door. 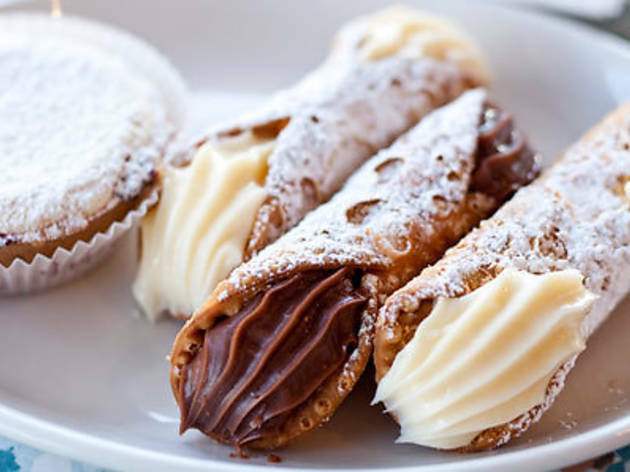 From the outside this modest-looking pasticceria seems unassuming and run-of-the-mill, but inside the hustle and bustle hints at its status as a crowd favourite in the Inner West. The walls are plastered with "Dear Customer..." notes that remind us returns will not be accepted, but it is hard to fathom the necessity with pastries this delightful. Paradoxically, there's no signage describing the vast array of treats sitting in the glass cabinets below. Perhaps the pastries, cakes and meringues are decoration enough. 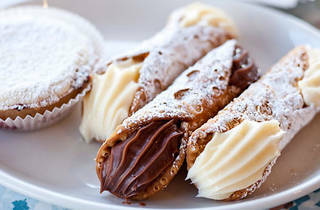 Fat cannoli come in chocolate, vanilla and custard (and also piccolo size) while chocolate-dipped, jam-filled biscuits melt in your mouth. The zingy jam sandwiched between the buttery biscuit is a lovely balance: chocolate plus jam equals splendido. The bigné (cream-filled profiterole-like pastries) are a little bit on the dry side, but let yourself be tempted by the heart jam-decorated, icing sugar-dusted shortbread: it's romance in a biscuit. The pasticceria also does a great line in gelati, and word on the street is the tiramisu cake is a goer. While Haberfield is dotted with establishments purporting to be authentic Italian, A&P's attention to detail and its vast range ensure it's the real deal. Do yourself a favour and join the queue.